Anne R. Allen's Blog: Social Media vs. a New York Times Book Review Cover: Which Sells More Books? Social Media vs. a New York Times Book Review Cover: Which Sells More Books? Yesterday Catherine Ryan Hyde and I spoke with a wonderful bunch of eager authors at the Digital Authors Seminar in San Luis Obispo. They were full of lots of great questions, some of which I’ll address here on the blog in coming weeks. We talked about the two events that have caused a seismic shift in the publishing business in the last four years: the introduction of the e-reader and the rise of social media as a marketing tool. Amazon, Facebook and Twitter: love ’em or hate ’em, they have turned the creaky old publishing industry on its ear. The way books are marketed has been revolutionized as much as their delivery system. Last week an article in Publishers Weekly backed up that statement with some hard evidence. They showed that even a favorable review on the cover of the NYT Book Review—one of the most coveted pieces of real estate in the publishing industry (and the object of most authors' most cherished fantasies) doesn’t do much to bump a book’s sales these days. Most books they studied did double sales for a short time, usually not more than a week or two, and one quadrupled sales—but most didn’t show more than a modest influence. And when I say modest, I mean just that. Arlie Russell Hochschild’s The Outsourced Self: Intimate Life in Market Times featured on the May 27th cover, had sold 52 copies the week before. With the NYT cover bump, it sold 134. That’s right: scoring a review on the cover of the NYT Book Review netted a sales increase of 82 actual books. So let’s compare that with the e-age way of marketing: using social media and free book giveaways on places like Smashwords and Amazon’s KDP Select. Catherine Ryan Hyde recently self-published her novels When I Found You and Don’t Let Me Go and put them into KDP Select. Why do authors want to give their ebooks away free? Because it’s the best possible advertising (as long as you have a great product) and it costs nothing. Zip Zilch Nada. Why doesn’t everybody do it? There’s one big obstacle. In order to put a book into KDP Select program, you have to give Amazon exclusive rights to sell that ebook. No B&N. No Smashwords. No Kobo. Not even sales from your own site. OK, so back to Catherine. In the week before its freebie days, When I Found You was selling “in the tens” per month. After it zoomed to #1 on its free days, it continued to sell thousands. But: it’s important to note that Catherine couldn’t have achieved her success with a giveaway alone. An author can offer any number of free books, but if nobody knows they exist, nobody will download them. That’s why your social media presence is so important. By the time you have a book to sell/give away, you need to have a network in place that can spread the word to thousands. When Catherine’s second self-pubbed book, Don’t Let Me Go went free last weekend, Catherine tweeted it to her 1150 followers. Since I’m one of them, I retweeted to my 3200 followers. Two followers even thanked me—and because most people don’t thank for tweets—I assume many more downloaded it. I also assume they went on to broadcast the news to all their Tweeple. This is why Twitter is probably your most important marketing tool. But you have to get that network established long before your book comes out. One of the best ways to do that is to tweet links to things that your readers might be interested in. Write sci-fi? Tweet links to trailers of new sci-fi films, sci-fi bloggers, etc. Write cookbooks? Tweet links to great recipes--not all your own. :-) Write women’s fiction? Tweet everything Jennifer Weiner says about valuing the genre. The point is to have people in place who have a habit on clicking on your links for good content. Not just your own stuff. Catherine also did a Facebook promotion coordinated by an outfit called Shindig: a two-hour chat that fans could attend for free. It was a rousing success—and Don’t Let Me Go shot to #1 in the whole Kindle Store and stayed there for three days. It’s now selling better than any of her other books. This is why you need a social media presence. Yes, even if you do get that NYT review. I’m aware that people in the know will say the freebie days on Amazon are not working as well as they used to—and may soon not work at all. The Amazon algorithms changed again recently, and the freebie bounce in real sales isn’t as high as it used to be. There’s also the serious drawback of the exclusivity demanded by Amazon to enroll in the KDP Select program that allows the free days. But no matter what new promo comes up next, chances are pretty certain you’ll only be able to utilize it if you already have a social media platform. Just going on Twitter two weeks before launch and saying “buy my book” (Or worse, hiring somebody to tweet it for you) isn’t going to cut it. But you can grow your network anywhere: LinkedIn, Goodreads, RedRoom, Pinterest or Tumblr. Or Vlog on You Tube. Find one that works for you and then start making friends. Don’t spread yourself too thin by going on all of them. Check them out and then linger in places where you find kindred spirits. Yes. Kindred spirits. People you like. Social media is social. So be sociable. It’s like being at a party. Don’t brag or talk about yourself or beat your chest and bellow. Talk about shared interests. Like what books you like to read. What music you like. Your obsession with Dr. Who. So, even if you're a romance writer, don't just talk romance writing. Instead, you might start exchanging Dr. Who lore with a bunch of people on RedRoom, and pretty soon you’ll find a Whovian who also likes romance. Voila—a potential reader. And yes, it’s possible to relate hot romance with Dr. Who. Here’s a great post at Passionate Reads from Marilyn Campbell. What about your blog? That’s social media, right? If you have a blog is it OK if you’re not on other social media? Sure. As long as you use that blog to network—going to other blogs and commenting and making friends. Just sitting there in your lair writing about your book and attracting three hits a month isn’t going to help sell your book. For info on how to start an author blog, see my blogpost on How Not to Blog, or read my How to Blog series in the book I’ve written with Catherine, HOW TO BE A WRITER IN THE E-AGE. Reminder: I strongly urge new and unpublished writers NOT to blog their WIP or post excerpts from an unpublished piece! That’s giving away your first rights and will limit your book’s publishability. It’s OK to blog about writing some of the time when you’re starting out--that’s a way to make friends with other writers and people in the industry. I know a number of authors who found their agents or publishers from recommendations from other writers they met through their blogs. And I think I should mention this in every post, because about 90% of unpublished writers do this. Don’t forget to post an “about me” page that contains your CONTACT INFORMATION. Without a bio your blog is useless. For help on writing your author bio, read my post on Write Your Author Bio Now. Personally, I think a blog is a huge asset for a writer, because it allows you to have a flexible online home base where people can always find you and communicate. Whether it’s an agent who’s trying to decide whether to request your manuscript, a fellow writer who wants to respond to a comment you left on another blog, or a reader who loved your new book, a blog is useful at any stage of your career. But the main purpose of whatever form of social media you choose is interaction. You need to communicate with other people. Otherwise, you might as well be sitting in your basement holding a sign. No matter how brilliant and beautiful the sign, it doesn’t do any good if nobody sees it. You’ll be wasting your time--and you'll be stuck in reruns of that fantasy where you land the cover of the NYT Book Review. Which will probably only sell 82 books. What about you, Scriveners? Do you have hot fantasies about the NYT Book Review? What form of social media works best for you? 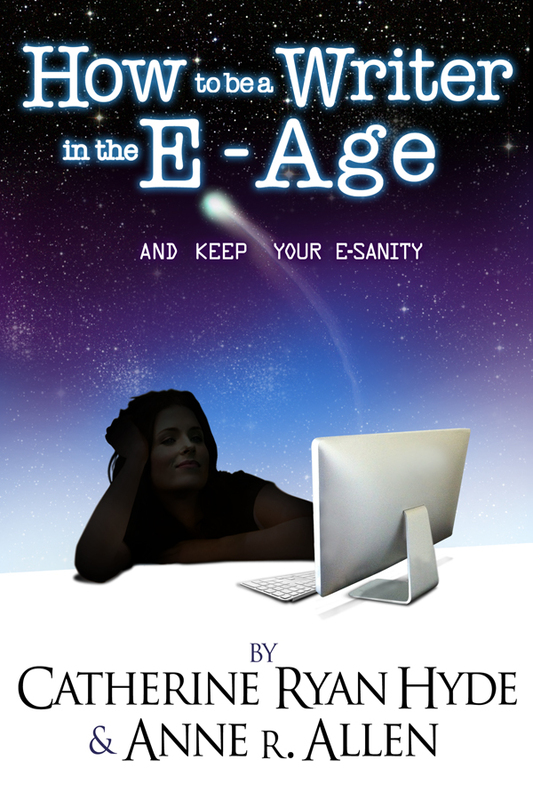 Thank you, everybody who downloaded HOW TO BE A WRITER IN THE E-AGE…AND KEEP YOUR E-SANITY (written by Catherine Ryan Hyde and yours truly.) Our free days were a rousing success. We immediately went to #1 in writing skills books in the Kindle store in both the US and the UK and stayed there for all three of our freebie days. We beat out Mark Coker's free book, the new conversation between Joe Konrath and Barry Eisler, and Noah Lukeman's new book on agents. All authors I really respect. Pretty amazing. But it's still a good deal. It's only $2.99 for another month or so. You can buy it at Amazon in the US, or in the UK. Remember, if you don’t have a Kindle, you can download a FREE app for your computer, phone or tablet RIGHT THERE ON THE AMAZON BUY PAGE. And if you have a NOOK here’s how to download an app so you can get free Kindle books to download to your NOOK. And remember, this ebook comes with free updates every six months! And for you die-hard treeware lovers, the paper book is coming! A little slower than we hoped, but it is in the proofing process. Tor those of you who signed up early for our mailing list, we promised we would award a copy of a signed first edition of Catherine Ryan Hyde's iconic novel PAY IT FORWARD to one lucky winner today. So the winner, chosen by the random number generator at random.org is CORA RAMOS!!! Congratulations, Cora! And further congrats to longtime follower of this blog, children's author Lorie Brallier, who also attended the seminar yesterday--and today was offered representation by the Karen Grenick Literary Agency! Congrats, Lorie!